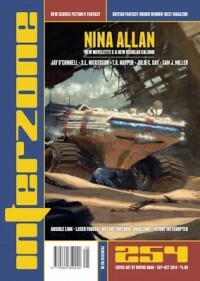 Now writing a column for Interzone, Allan’s latest story for them stops just as it’s getting interesting, so I’m hoping there’s at least one more followup story! Jay O’Connell. A Minute and a Half. Evan is surprised to find an ex-lover, Helen, turn up on the doorstep, a decade since she foreswore seeing him again. And doubly surprised that a daughter that he was unaware of is in tow (and is only a few years old). The conception, and the actuality of the birth were both managed by Helen keeping her mouth shut. She gives him an opportunity to leave his current life, and his current self, behind, to re-programme himself and head for pastures new. But there’s a catch and what might otherwise have been a story about relationships becomes much more life and death. Near future story in which a young woman with a disfiguring bone disease has to rely on sponsors logos tattooed on her skin to get the treatment for her condition. Only four pages, and it would have been good to have had more. T.R. Napper. Dark on a Darkling Earth. An effective story from Napper, set in a near future world feeling the effects of global warfare, through a small group of soldiers, and an ‘Omissioner’, one with a status due to his ability to actually remember things, an ability that warfare has removed for most. Julie C. Day. The Faces Between Us. A four-pager, exploring some of the wide open spaces of Oregon (note to self : avoid), as a young couple find something in the cellar that makes snorting cocaine looks like a healthy option…. A four-pager that resonates strongly with this reader! A forty-something married couple are driving to watch their daughter’s music recital with a university place at stake. If you’ve been in such a position, you’ll know that this kind of thing can give you pause for thought, as you realise your halcyon days at university are long gone. Especially when certain songs can trigger a return to that time and place. (For the record, for me it’s XTC’s ‘Making Plans for Nigel’ which takes me back to the first term at Leeds Polytechnic in September 1979). There’s a stronger issue here, as the wife/mother really does go deep when she flashes back…. Miller really captures the mood well. Some well-crafted stories, but an issue that feels just a little light on the fiction, with four short stories and novelettes that aren’t quite as substantial as you might like.